Episode 50: Sleepaway Camp 2: Unhappy Campers!! 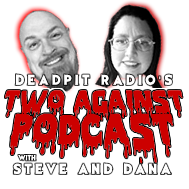 This time Dana and Steve do a commentary for Sleepaway Camp 2: Unhappy Campers and Angela is up to her old tricks--Starting the body count off right. Its time for Summer Camp in Blu-ray, Boz! The long awaited return of The B-Plan this week, and what led to his suspension. Plus CK and company discuss some of the latest ideas from people that seem to not have a damn clue including whats going on with the new Friday the 13th movie, Romero's DEAD TV show and why the inmates are seemingly running the asylum on every level...tune in and keep it creepy here at DEADPIT.COM!!! Episode 49: Mo' Mutts, Mo' Movies...Holla!! This time Dana and Steve check out Lucio Fulci's Quacktacular New York Ripper and do a commentary coming next week. Also check out the independent horror flick Murder University from 2012. 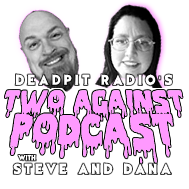 The DEADPIT boys return once again to go through the latest news (or lack of) in the world of horror plus a plethora of topics including the rise and fall and rise again of vinyl records, Pennywise returns, Uncle Bill's thoughts on 'It Waits' and MUCH MUCH MORE this week on DEADPIT Radio! !